Annaabishegam (rice abishegam) for the Shiva Linga once in a year - organized by Kanchi Kamakoti Peetam. This is one of the most important festival of this temple and it is mainly organized by Shankaracharyar of Kanchi Kamakoti Peetam. As mentioned earlier the Lingam (Peruvudaiyar - main deity) is one of the Ratchasa Lingam i.e, a Giant Lingam due to its huge size is decorated with rice. It requires 75 gunny bags of rice to completely cover the huge size of the Lingam, the whole Lingam looks like a white hill of rice. The Abishegam prasatham (i.e, the rice after offering to Lingam) is served as Annadhanam (free food) on that day. The temple is under the control of ASI (Archeological Survey of India ) and HR&CE. The office of HR&CE is located inside the temple. 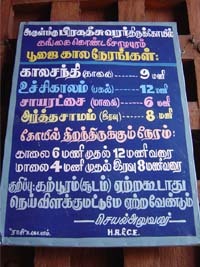 One can contact the HR&CE office for pooja related service.